Este artigo é sobre the disease Vampirism, in particular the effects it has on the player. Para NPCs who are vampires, veja Vampire. This power is similar to the Calm spell and can be used once a day. Once the Dawnguard plug-in is installed, Vampire's Seduction will allow you to feed on NPCs at any time, regardless of whether they are sleeping. If you do not possess this power during the vampire version of the quest ProphetDG, you will temporarily receive it in order to enthrall Dexion Evicus, only to have it disappear after use. While a vampire, sometimes wearing the Blackguard's Hood[verification needed — see talk page], Thieves Guild Hood, or Guild Master's hood makes the top of your head bald and the hood doesn't show. This enables vampires to equip those hoods together with other headgear. A vampire can thus wear up to three pieces of headgear simultaneously: the Thieves Guild or Guild Master's hood; any circlet or dragon priest mask; and a Penitus Oculatus helmet, Falmer helmet, or the Jagged Crown. Note that version 1.2 of the Unofficial Skyrim Patch will prevent you from wearing circlets or dragon priest masks with other headgear. 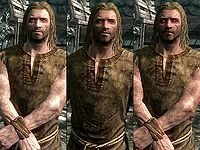 Falion's cure when applied to Volkihar vampirism does not set their faction (xx003376) to -1. As a result any NPCs remaining in Fort Dawnguard will attack on sight even though you have been "cured" of vampirism. ? Esta página foi modificada pela última vez à(s) 22h09min de 20 de dezembro de 2017.